As Lead Crew Pilot - (12 credited missions) 262, 272, 274, 277, 285, 298B, 315, 317 ,332, 349, 352, 363 20 April 1945). Capt George R. Sirany (P) - As Crew Pilot - Two missions as CoPilot with an experienced Combat Pilot (1Lt William E. Eisenhart) - 146, 150. Others as First Pilot. Signed up for a second combat tour and became a Lead Crew Pilot. Completed First combat tour on 13 July 1944. Last mission on second tour 20 April 1945. 2Lt James H. Batton (CP) - 30 credited missions flown as CoPilot: With Capt Sirany - 20 missions (147, 149, 151, 152, 155, 157, 159, 160, 161, 162, 164, 165, 170, 171, 172, 174(AS), 175, 176, 177, 186, 194; With other Pilots - 10 missions (146, 150, 169, 178, 183, 185, 187, 192, 197, 204. Completed combat tour on 16 July 1944. 1Lt Warren D. Ehrke (N) - 30 credited missions flown: With Capt Sirany - 20 missions (146, 147, 149, 150, 152, 155, 157, 159, 160, 161, 162, 164, 165, 170, 171, 172, 174, 177, 186, 194) With other Pilots - 10 missions (167, 180, 182, 187(LC), 197, 199(LC), 207(LC), 212(LC), 213, 216(LC). Completed combat tour on 1 Aug 1944. Capt Henry R. Prussman (B) - 27 credited missions flown: With Capt Sirany - 15 missions (146,147, 149, 150, 152, 155, 157, 159, 160, 161, 162, 164, 165, 170, 171). With other Pilots - 12 missions (167 Lead crews -183, 187, 190, 198, 201, 207, 208, 213, 214, 218, 224. Last mission flown on 9 August 1944. T/Sgt Thomas O. Stephenson (E/WG) - 24 credited missions flown: With Capt Sirany - 22 missions - As Engineer (146, 147, 149, 150, 152, 155, 157, 159, 160, 161, 162, 164, 170, 171, 172, 174, 177, 179, 181). As Waist Gunner [165, 175, 182(LC)]; With other Pilots - 2 missions 234, 236). Last mission flown on 5 Sept 1944. Was wounded on mission 182, 16 June 1944, and spent several days in the 303rd Station Hospital where he was visited by some of his fellow crew members. T/Sgt Everett E. Van Horn (R) - 34 credited mission flown: With Capt Sirany - 30 missions; With other Pilots - 4 missions (199(LC), 201(LC), 202, 203). Last mission flown on 13 July 1944. S/Sgt George E. Bale (BTG) - 31 Credited missions flown: With Capt Sirany - 30 missions; With other Pilot - 1 mission [204(LC)]. Last mission flown 16 July 1944. S/Sgt Robert C. Umberger (WG) - 26 Credited missions flown: With Capt Sirany - 19 missions (146, 147, 149, 150, 152, 155, 157, 159, 160, 177, 179, 182(LC), 184(LC), 186, 191(LC), 194, 201(LC), 202, 203); With other Pilots - 7 missions (204(LC), 213(LC), 216(LC), 234(LC) 236, 237, 238). Last mission flown on 9 August 1944. T/Sgt Cecil J. See (WG/E) -31 Credited missions flown: With Capt Sirany - 26 missions- As Waist Gunner (146, 147, 149, 150, 152, 155, 157, 159, 160, 170, 171, 174). As Top Turret Gunner (172, 177, 179, 181). As Engineer/Top Turret Gunner (175, 176, 182(LC), 184(LC), 186, 191(LC), 194, 201(LC), 202, 203); With other Pilots - 5 missions (204(LC), 213(LC), 223, 224, 225). Last mission flown on 11 August 1944. Mission 151, 11 May 1944 - While taxing into takeoff position the hydraulic system on #42-97272 Duchess Daughter (359BS) BN-T failed. 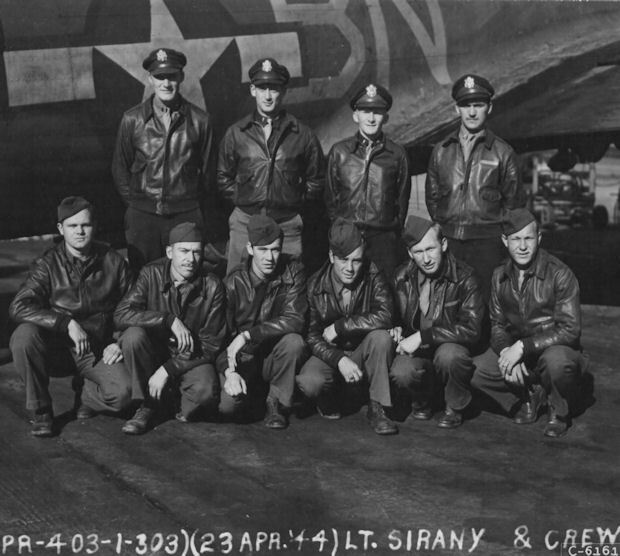 2Lt George R. Sirany (P) suddenly had no brakes and his B-17 taxied into B-17 #42-97284 Ain't Misbeahavin (359BS) BN-S and then swung around and hit #42-97058 Scorchy II (359BS) BN-V. All three BG-17s were damaged and unable to participate in the scheduled combat mission to Saarbrucken and Volkingen, Germany.